If you feel that your brain lacks power, the problem may very well be in your diet. And it can be possible that you aren’t getting the essential vitamins from your food. In that case, you may very well want to supplement yourself or make changes to your diet to include these essential vitamins. 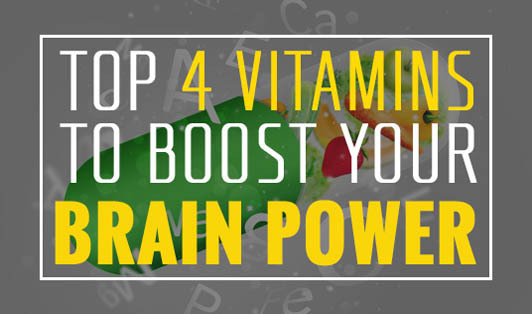 Here are 4 such vitamins that can help you improve your brain power and short-term memory, as well as boost your overall brain performance. Folic acid manages the levels of homocysteine in the blood. Deficiency of folic acid in the body elevates the homocysteine level, resulting in damage to brain cells. So, in case you lack brain power, then it is strongly recommended you take foods rich in folic acid like green leafy vegetables, legumes, beans, and lentils. Vitamin B12 plays the vital role of maintaining optimum health of your nerve cells. The B12 vitamin produces the myelin sheaths that protect the nerve fibers and insulate them against the brain’s electrical impulses. This is extremely important, as several mental health problems occur from the misfiring of nerve cells lacking the protective myelin sheath. Studies done in the past have also shown that vitamin B12 can prevent memory loss and enhance brain power. The vitamin is primarily found in animal products like meats, poultry, fish, pork, and beef. Fortified cereals and milk are also good sources. Vitamin C scavenges the free radicals that can damage your brain cells. It is the most readily available antioxidant in the market. Make sure you take enough vitamin C to boost your brain’s overall performance. Vitamin C is found in a variety of citrus fruits and vegetables as well as sprouted legumes. Vitamin E is another nutrient that acts as an antioxidant that protects your brain and nerve cells from free-radical damage. Studies have shown that supplementing a diet with vitamin E can prevent progress of Alzheimer’s disease or even help prevent it altogether. Nuts and oilseeds are good sources of vitamin E. It is also found in small quantities in grains and sweet potatoes.